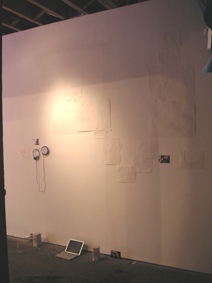 The laptop computer was placed on the floor by the western wall, and the piece of music created on the instrument built in the gallery was played through the speakers. 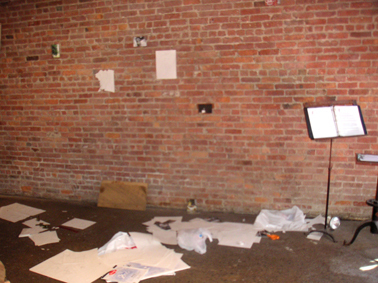 The slideshow of images of myself playing on the instrument could be seen on the computer screen. 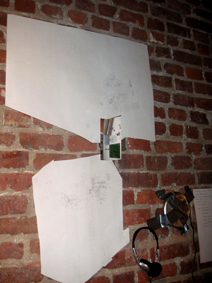 The drawing of a figure playing instruments in an apartment was moved from it's position on the outer eastern wall and instead placed upside-down above the drawing of the rehearsal space, on the inner eastern wall. 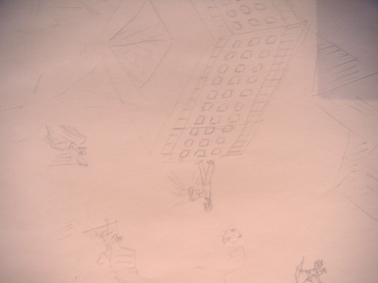 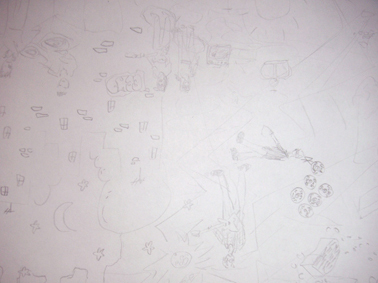 On the right-hand side of this drawing two new ones were placed: the first one of an apartment building with a group of people inside it, the other one depicting a figure playing a trumpet with ladybugs around his head. 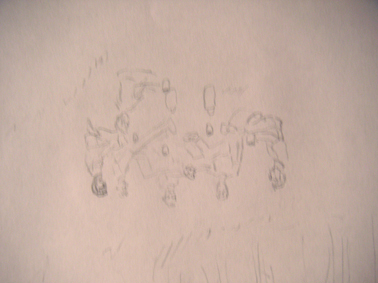 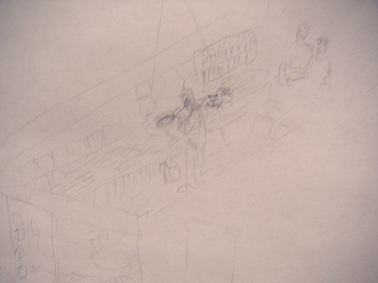 Below this figure could be seen a drawing of a house, with two persons sitting by a table. 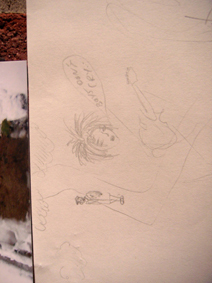 On the CD-player next to the drawing of the rehearsal space could be heard, in addition to the previous Kartoffel Menschen Trio tracks, two home-recordings I had made in Göteborg: the first one was of the song "Sleepytown", written by Fred Astereo (Stanley Paulzen) and the other one was of "Happy Birthday, Dear Friend Lisa" written by Jens Lekman. 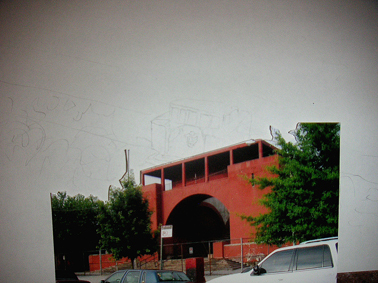 The drawing of the band Jelly NYC performing in the McCarren Pool Park was removed from the wall, and in it's place was hung a large drawing of the Pool Park with a starry sky above it. 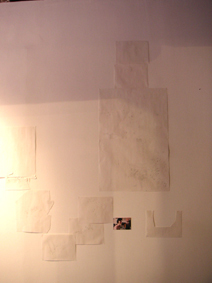 Around this drawing the cut-out drawings of the buildings (which had previously been on the western wall) were arranged. 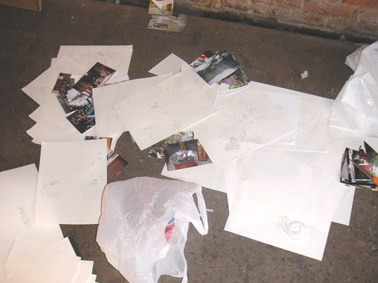 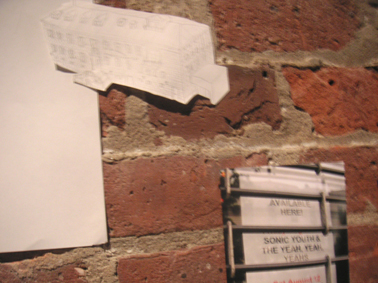 A photograph of a flyer presenting a concert by Sonic Youth and the Yeah Yeah Yeah's was placed to the right of this cluser of drawings. 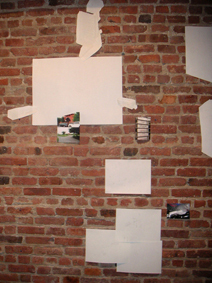 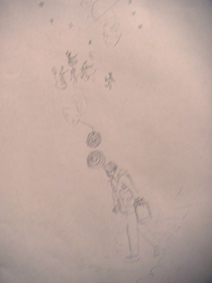 The group of drawings of a figure walking by a record store, the inside of a record store, some figures barbequeing, and the photo of the Love Is All album were all removed from the wall. 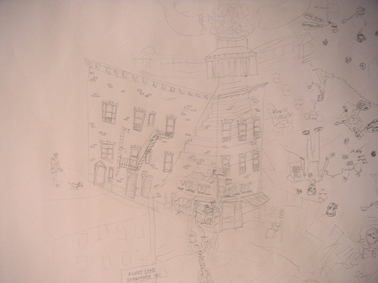 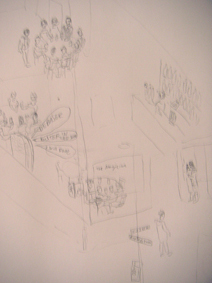 In their place a large drawing of a figure listening to records in a record store, with a sprawling environment of people and buildings above him, was placed upon the wall. 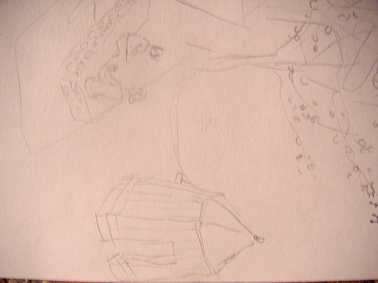 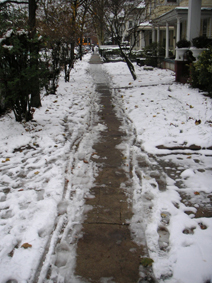 To the right of this drawing a photograph of a snow-covered sidewalk was placed. 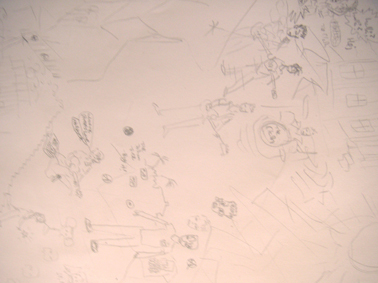 To the right of the photograph a drawing was placed depicting a figure walking on a path, surrounded by another figure with a guitar and a word-balloon bearing the text "Boys don't cry", as well as a large head. 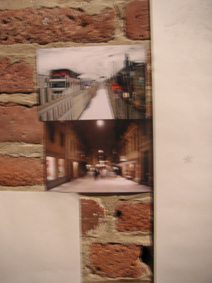 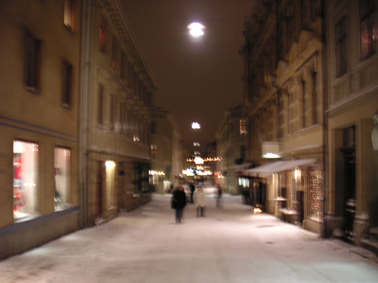 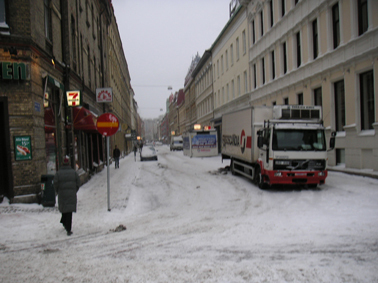 To the left of the large drawing of the record store two photographs of snow-covered city streets were placed. 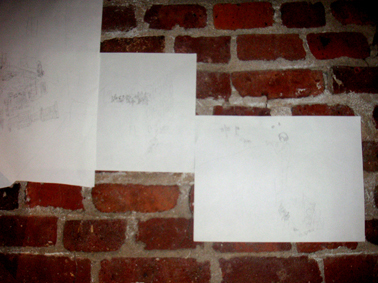 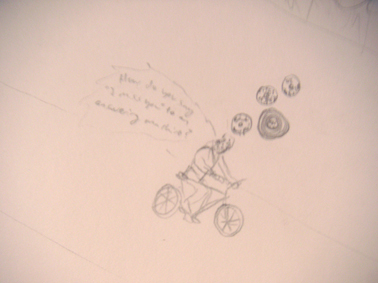 To the left of these photographs could be seen a drawing of a walking figure carrying a bag of music albums, and with some figures playing a concert depicted above his head. 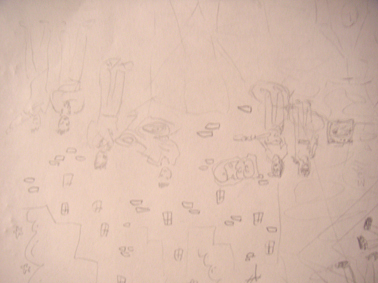 On the western wall the drawing of the DJ:ing figure and the cityscape was removed and in its place was put a large cluster of drawings depicting several figures surrounding a building. 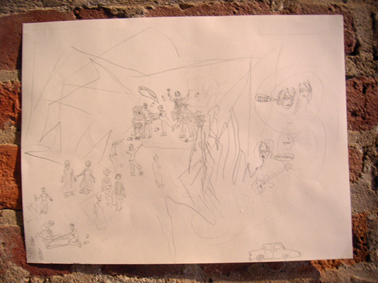 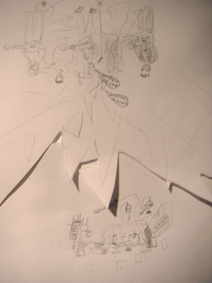 Added to the cluster of drawings depicting the band Sonic Youth playing in the skies above a forest landscape was a cut-out drawing of a band performing music (with word-baloons reading "Riot at McDonald's" and "State of the Union"), placed right above the drawing of a rehearsal room in a house. 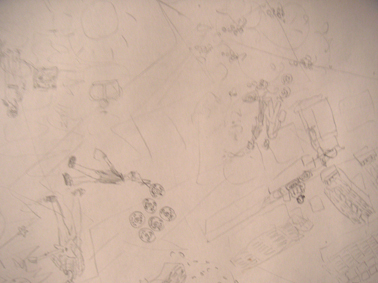 On the far right of this cluster a large drawing depicting several people in a bar, a rollercoaster, and a figure on a bicycle was placed. 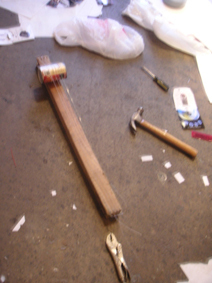 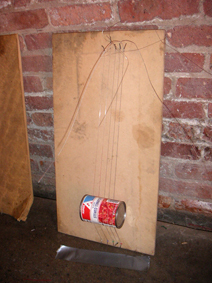 Two instruments were built using scrap wood found outside the gallery, electric guitar strings and tin cans. 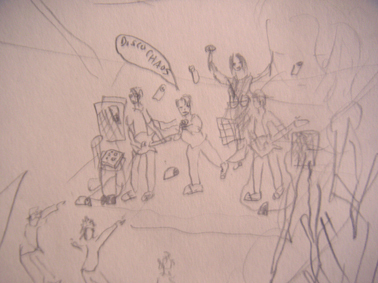 On the eastern wall, in the area where the drawing of a figure playing instruments in an apartment used to be situated, could now instead be seen a drawing of a band performing a concert (with a word-balloon emanating from the singer bearing the words "Disco Chaos"). 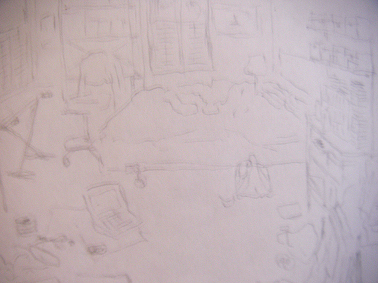 To the right of this drawing another one was placed, depicting the interior of a room.